Recreational marijuana became legal in the state of Oregon in 2015, and I fully supported this law. Cannabis is a plant that was created by nature, god, mother earth, or whatever your belief system may be. This past summer, we grew the four plants that we were legally allowed in containers in our backyard, next to our tomatoes and squash. 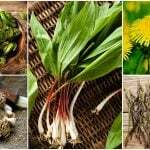 We harvested it in the fall along with our other vegetable and herb crops. 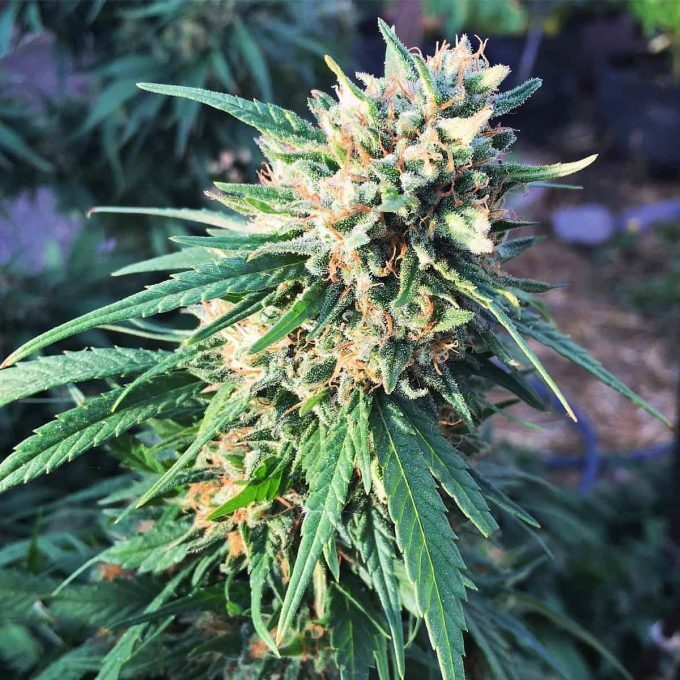 We grew varieties that are high in a compound called CBD, which stands for cannabidiol. CBD does not get you high like THC does (another main component of cannabis), and is highly medicinal and pain relieving. I decided to make some CBD infused oil for topical use using the Harlequin variety that we grew, which is extremely rich in CBD. Disclaimer: I only endorse you making infused CBD oil at home if recreational or medical marijuana is legal in your state, and you have any required cards and/or licenses to do so! If you are unsure what the marijuana laws are in your state, here is a handy guide from NORML (National Organization for the Reform of Marijuana Laws). 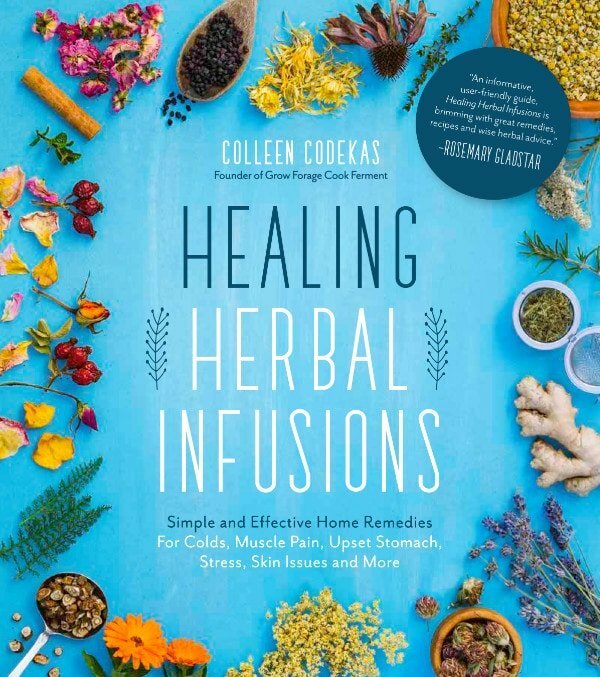 They also have a great page titled Sourcing CBD: Marijuana, Industrial Hemp, & the Vagaries of Federal Law that is an excellent read for more information on this. 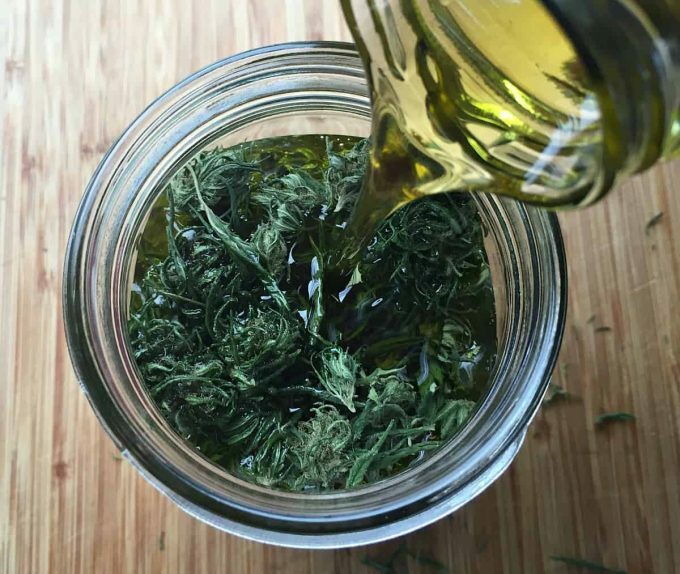 You will want to use a high CBD cannabis strain to make this infused oil. Some popular CBD strains are Harlequin, ACDC, Remedy, and Charlotte’s Web, but there are many others to choose from. Check with your local cannabis pharmacy to see what they have in stock. 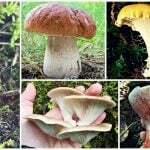 If you are interested in growing your own I recommend buying seeds from Seedsman. 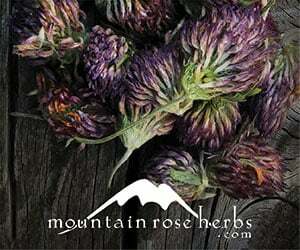 They have a large selection of high CBD varieties and ship to nearly everywhere. 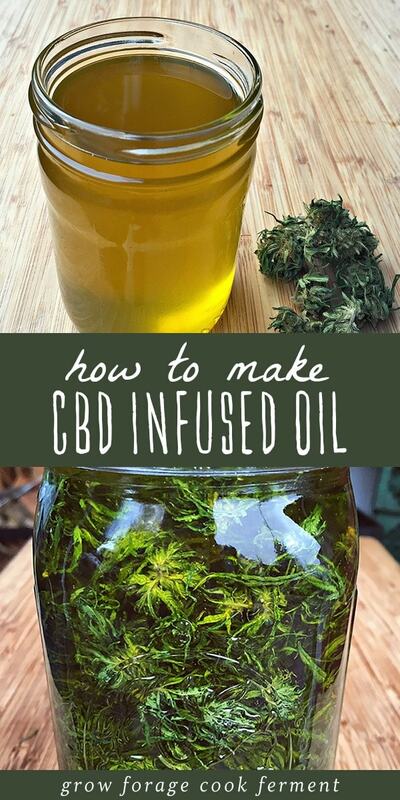 Now let’s get to making this CBD infused oil! 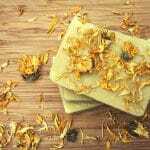 This recipe is intended for use as a topical pain relieving oil that can be used as is or turned into a salve. 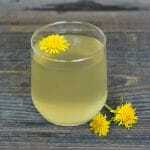 I will be making a salve from this oil, you can see my recipe for that here. 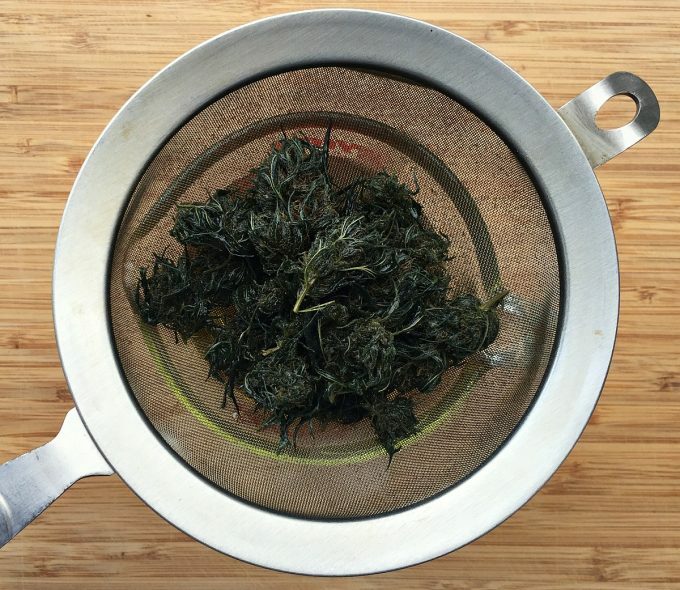 The first step once you have your dried buds from a high CBD strain is to decarboxylate them. This is actually an optional but recommended step, as it will make more of the CBD bioavailable to the body. Luckily, it’s an easy process as well. Simply spread your buds out in a single layer on a sheet pan and bake at 230°F for 40 minutes. As you may have noticed, we did not trim all of the inner leaves off of these buds, because they were covered with crystals that we didn’t want to go to waste! 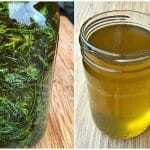 Then put your decarbed cannabis buds into a jar and completely cover them with the carrier oil of your choice. 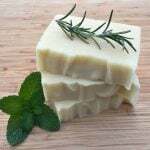 I used a blend of approximately 25% unrefined coconut oil, 25% sweet almond oil, and 50% extra virgin olive oil. 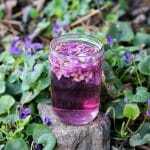 Cover the jar with a lid and let sit in a dark place for at least six weeks. 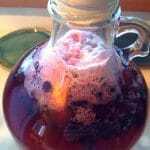 You may want to gently heat your oil a few times while it’s infusing, especially if you did not decarb your buds first. I like to do this in my Excalibur dehydrator, as it has excellent temperature control. I don’t like to heat my oils at too high of a temperature in order to preserve the quality of the oil and to keep it from going rancid. 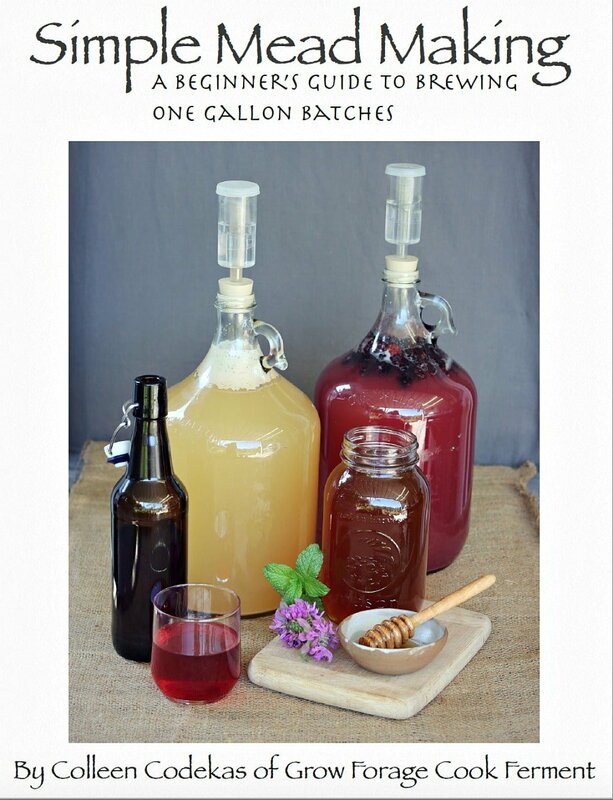 This is not as much of an issue if you are making edibles rather than topicals, as they are generally consumed within a much shorter amount of time. When you are ready to use the CBD oil, strain out the buds with a fine mesh seive. 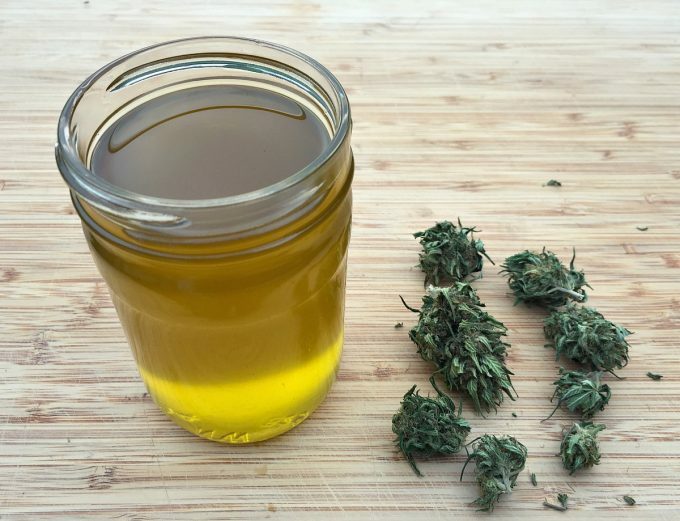 If you want to make a super strong CBD infused oil, place a second round of decarbed buds into the oil and repeat the process. You will end up with a highly fragrant and beautiful CBD rich oil! 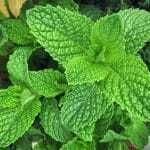 There are many amazing uses for this oil, but the most popular use is probably for its pain relieving properties. Here is a list of all the medicinal benefits of CBD and its products, such as this oil. 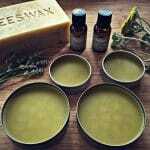 I decided to turn this oil into a topical healing cannabis CBD salve, check out my recipe! 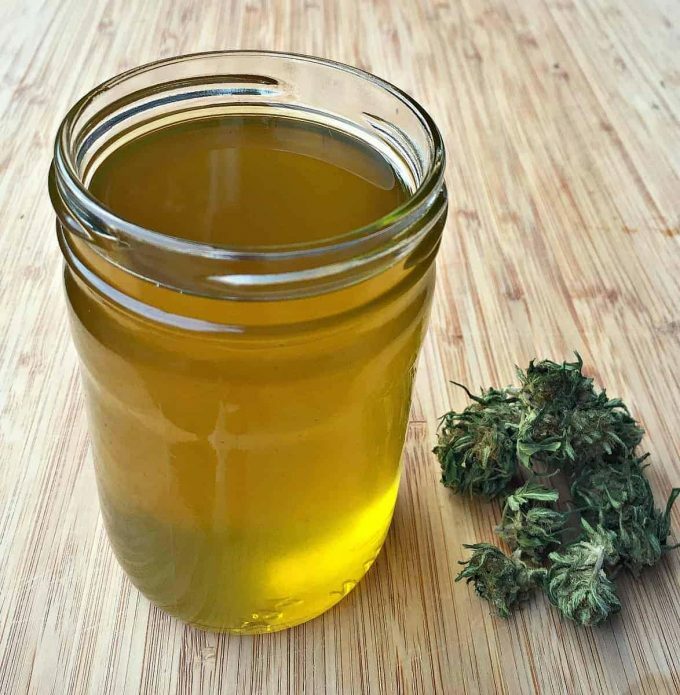 Or if you’d prefer, you can see my homemade cannabis CBD tincture recipe here. 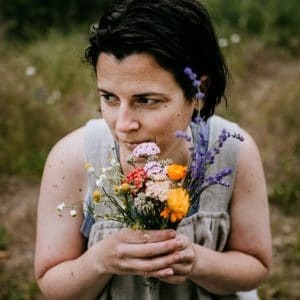 If you aren’t able to make your own, I have found an amazing place to buy super high quality organic CBD products! I searched high and low for a cannabis company I could recommend, and Flower Child CBD is it. 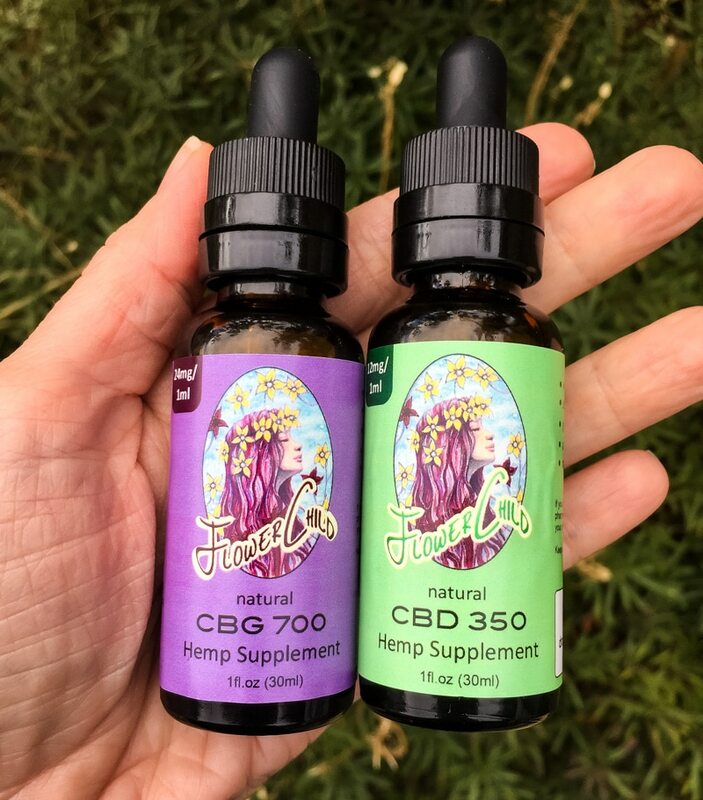 They are a Colorado company, where recreational marijuana is legal, but they use pure CBD extract from organic hemp, so they are able to ship their products nationwide! If you’d like to try CBD but are worried about the legal issue, or don’t want to use cannabis or hemp derived CBD, check out this Humulus Oil (I’m on the search for a new source). It’s made from hops which are in the same family as cannabis and also contain naturally occurring CBD. Is medical or recreation cannabis legal in your state? 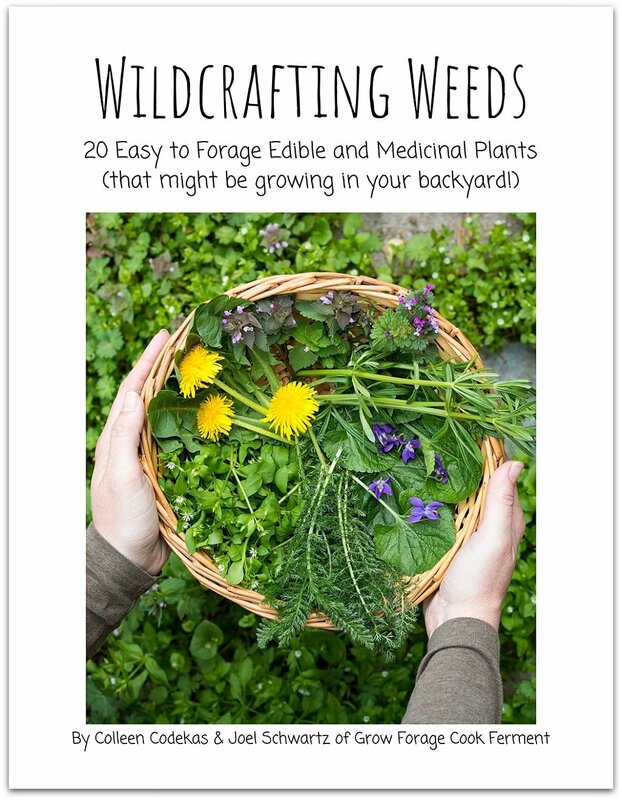 If so, will you be growing it or using it in any way? CBD oil has many benefits and medicinal uses, the most popular being for all natural pain management. 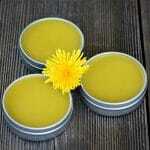 CBD infused oil can be used to make a topical CBD salve. Preheat the oven to 230°F. 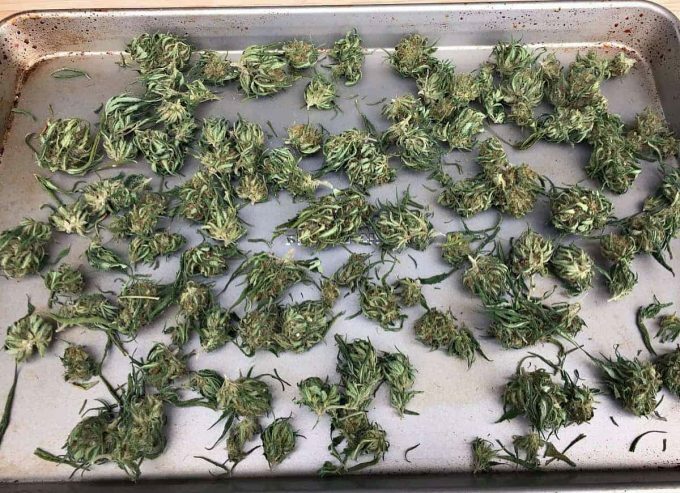 Decarboxylate dried buds by spreading your buds out in a single layer on a sheet pan and bake for 40 minutes. 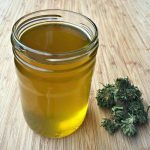 Put your decarbed cannabis buds into a jar and completely cover them with the carrier oil of your choice (use more oil if needed to cover). 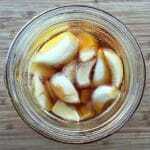 Cover the jar with a lid and let sit in a dark place for at least six weeks. When you are ready to use the CBD oil, strain out the buds with a fine mesh sieve. 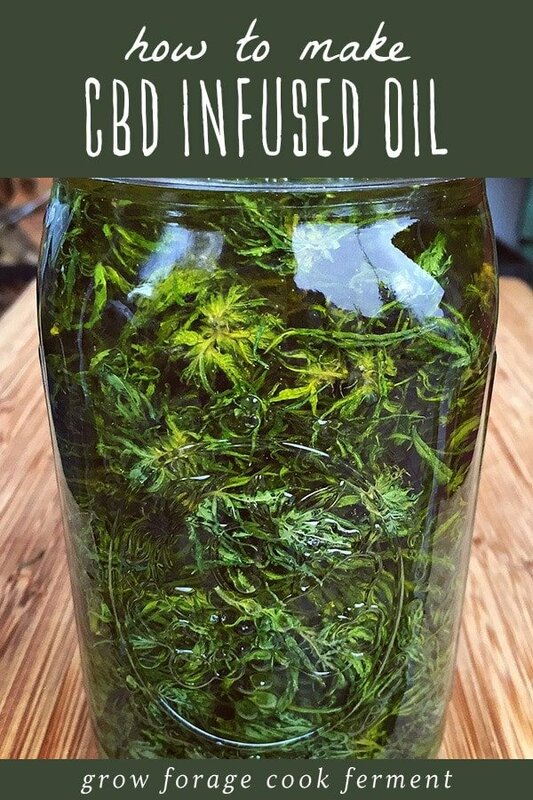 If you want to make a super strong CBD infused oil, place a second round of decarbed buds into the oil and repeat the process. Do you throw the buds away after you strain them out or is there a secondary use for them?